Jane Boyden playing from Bird Spirits, 2000. Photograph by Ian Boyden. Bird Spirits considers the crow, especially its animated personality, through music and image. The result of a collaboration between composer William Bolcom and artist Frank Boyden, this book shies away from typical corvid symbolism of death and foreboding. Instead, the performer, listener, and viewer are transported into a realm of avian dance, trickery, percussion, posturing, and calligraphy. In 1999, Frank Boyden commissioned Bolcom to write a piece of music to give to Jane Boyden as a retirement gift. As payment for this piece, Boyden sent Bolcom a suite of nine drypoint prints of crows. Bolcom wrote nine short piano pieces in response to this suite of drypoints. 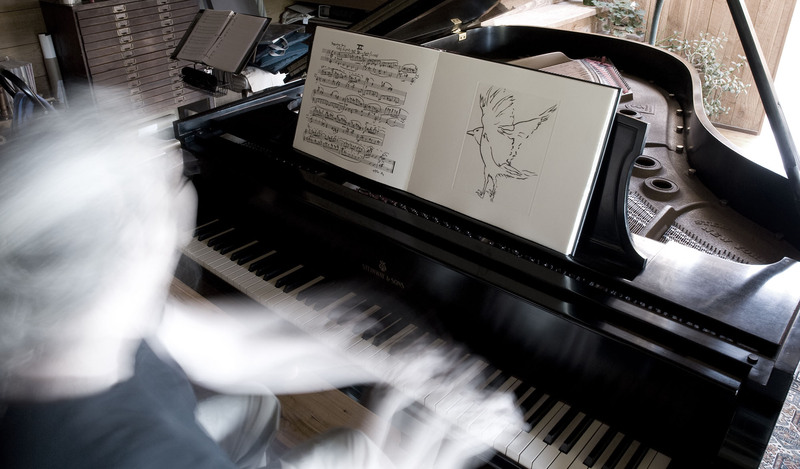 It became quickly apparent that this project could find its form as a collaborative artist book with each original handwritten score paired with the corresponding print of a crow. The book is printed on Hahnemühle Copperplate, endpapers are Hahnemühle Bugra, the covers are finished with same lacquer as used on Steinway pianos. Each volume is presented in a Solander box adorned with a copper image of a crow foot print. Dimensions: 11.25 x 14.375 x 1 inches. 48 pages.